My Big Girls Turned 3 & 4 This Year! They insisted on a Wizard of Oz themed birthday party, we started planning MONTHS in advance. 'Somewhere Over the Rainbow' fruit skewers. I had seen this several times on Pinterest & finally found an excuse to make them! Both the girls got their own 3 layer Dorothy gingham rainbow cake from Merritts Bakery Tulsa, we went with one chocolate & one vanilla. Aunt Jen started a fantastic tradition of buying the girls their cakes as part of her birthday gift to them. It takes one thing off my planning plate! 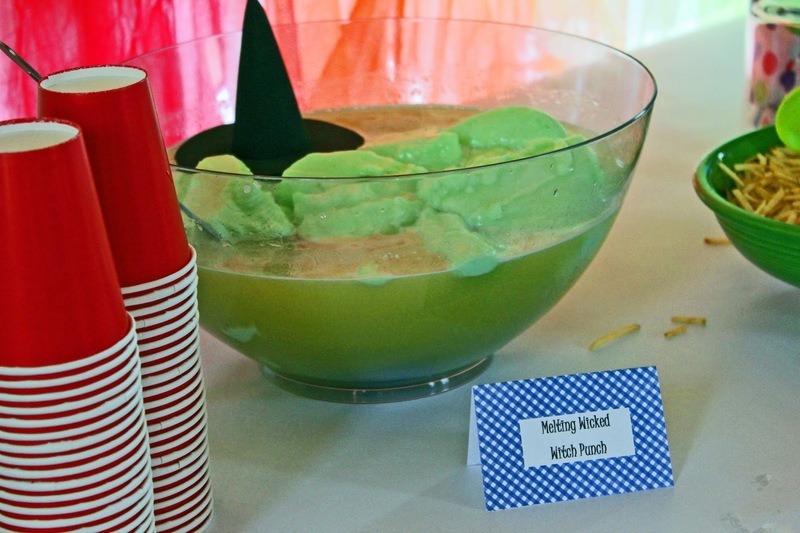 'Melting Wicked Witch Punch', another Pinterest idea. I found a basic pineapple & lime sherbet punch recipe, & made a floating witch hat out of black craft foam & hot glue. I used the shoe sting potato chips as 'Scarecrow Stuffing', I was pretty proud of this idea, cute huh!? The cake cutting seems to be the girls favorite part of any birthday party, they always tell you exactly which piece they want. I purchased card stock glitter hearts at Party City, punched holes in them & ran sliver glittery rope through them. All the kids all got 'Tin Man's Heart' necklaces. The party favors were 'Dorothy's Basket' full of Oz themed goodies. I purchased the baskets at the Dollar Tree & bought a couple yards of blue gingham fabric at Joann. I cut squares of the fabric with pinking shears to line the baskets. I found Oz coloring sheets online, printed off a stack & put them on the tables with crayons. I also topped the tables with white craft paper & asked guests to draw Oz themed pictures on them. Giving the kids an activity, is always a good idea. Plus, even grownups like to draw on the table! My husbands BFF Luke, crafted this fancy Oz cutout for us! It was fun getting pictures of the kids behind it. The 4 year old birthday girl as Dorothy! The 3 year old birthday girl as Dorothy! My 1 year old baby girl & her little buddy got a boost for a photo opp! Aunt Jen with the big 4 year old! I made both the girls matching Dorothy inspired dresses & we got them sparkly ruby red shoes to match. They looked adorable, & they can still wear them because they don't look like costumes. I didn't want to spend hours making them dresses they would never wear again! The party was A LOT OF WORK, but it was totally worth it. The girls will remember it forever, & if they dont, I WILL REMIND THEM! This was such a cute party!